This month of May has seen a lot of Suprise package from MTN with about four different data packages, they are still on with these surprise packages as they are not yet tired in surprising their loyal customers. I'm pretty sure that most of you guys are enjoying new MTN 500MB night plan that goes for just N25, launched few days back, they are here again with another fantastic night data package which serves as a better alternative to the MTN 500MB for N25 midnight plan.Whatever you use the data bundle for, live streaming, heavy download, normal download etc. MTN got you covered with suitable data packages. • Select 2 and then 8. Note ! 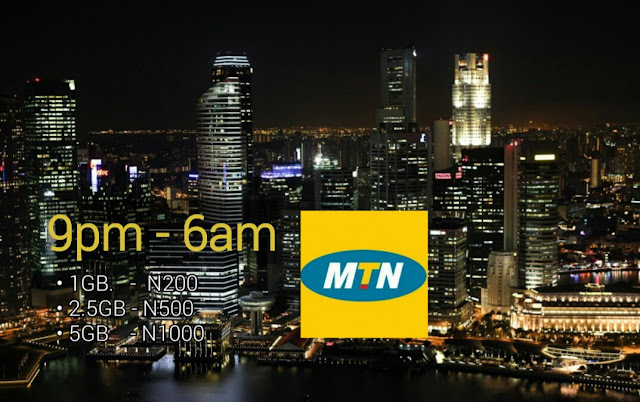 Each of the plans are valid for 30 a day period.This should serve as an alternative for those who can't wait till midnight for MTN 500MB of N25 (12:00am – 4:00am), then you can go for this latest plan ( 9:00pm - 6:00am ).